Background The aim of this study was to propose a novel, comprehensive, macroscopic classification for bile duct lesions. Methods A two-stage protocol was designed. 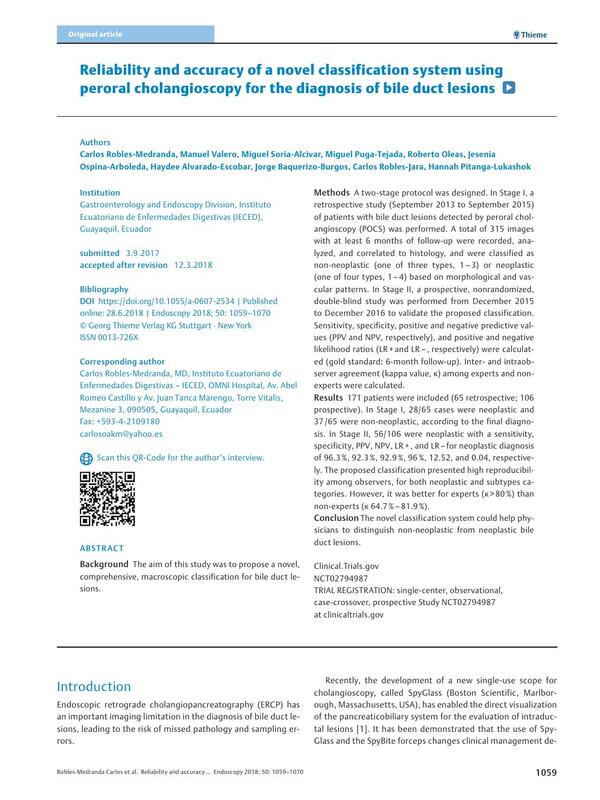 In Stage I, a retrospective study (September 2013 to September 2015) of patients with bile duct lesions detected by peroral cholangioscopy (POCS) was performed. A total of 315 images with at least 6 months of follow-up were recorded, analyzed, and correlated to histology, and were classified as non-neoplastic (one of three types, 1 – 3) or neoplastic (one of four types, 1 – 4) based on morphological and vascular patterns. In Stage II, a prospective, nonrandomized, double-blind study was performed from December 2015 to December 2016 to validate the proposed classification. Sensitivity, specificity, positive and negative predictive values (PPV and NPV, respectively), and positive and negative likelihood ratios (LR + and LR – , respectively) were calculated (gold standard: 6-month follow-up). Inter- and intraobserver agreement (kappa value, κ) among experts and non-experts were calculated. Results 171 patients were included (65 retrospective; 106 prospective). In Stage I, 28/65 cases were neoplastic and 37 /65 were non-neoplastic, according to the final diagnosis. In Stage II, 56/106 were neoplastic with a sensitivity, specificity, PPV, NPV, LR + , and LR – for neoplastic diagnosis of 96.3 %, 92.3 %, 92.9 %, 96 %, 12.52, and 0.04, respectively. The proposed classification presented high reproducibility among observers, for both neoplastic and subtypes categories. However, it was better for experts (κ > 80 %) than non-experts (κ 64.7 % – 81.9 %). Conclusion The novel classification system could help physicians to distinguish non-neoplastic from neoplastic bile duct lesions.